Some would interpret my attitude of winning by any means necessary to imply that I have no appreciation of sportsmanship. Quite the contrary, I have observed that the very best players are likely to be excellent sports. Part of sportsmanship is keeping calm when you lose. 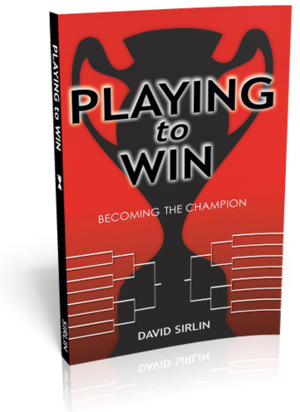 Playing to win involves viewing a loss as an opportunity to learn and improve. Getting hot-headed and yelling at an opponent or muttering under your breath that you lost to a “no-skilled scrub” does not accomplish that. Being a good sport also involves winning politely and observing customs of etiquette before and after a match such as bowing, shaking hands, saying “good game,” or whatever is appropriate. There is always the tendency to gloat, but being polite and reserved is the way to positively influence other people. Judges are people, too, and when a judgment call must be made, judges are often itching to find a technicality to use against a bad sport. Other players, perhaps potential sparring partners, team members, or keepers of secret information about the game are likely to be more open to a good sport than a raving lunatic or an idiot. Some ask why they should not scream racist or other offensive remarks, spit on the shoes of their opponents, beat their chests, or otherwise intimidate the enemy. After all, they say, the purpose is to win using any legal means, period. Isn’t that what I have said? First of all, some of these activities may not be legal in a tournament. Second, they violate the principle of goodwill that I described above. And third, I am not convinced they offer any real strategic advantage. They are more likely to make you look stupid, and create an air of negativity that will follow you. That said, I do know of a few skilled players who use these tactics. There is usually leeway in a tournament to be physically intimidating and say mean and scary things just short of actually violating any rules. Trash talking before the event over the internet is pretty much always legal, too. Perhaps these players are playing to their own strengths by being bullies. This behavior does give them advantages over some opponents, but the costs seem too great overall for me to endorse this as a winning strategy. If you wish to rile your opponent up, there are plenty of ways to do this within most games. There are ways of playing that are annoying and provoking. When an opponent plays defensively, expecting you to attack him, you can play defensively, too. This may annoy him and throw him off. Or, you can make moves that obviously have no purpose as a way of “taunting” an opponent you have an advantage over. Anything you do inside the game is good and right and beyond the scope of making you a bad sport. All is fair in war. If your aim is to intimidate the opponent, then I am all for that. But there are polite, sportsman-like ways of doing this. The best way by far is to win tournaments. See what your next opponent thinks of you then. Just give him something as simple as a half-hearted glance and empty-sounding “good luck” before the match and he will probably fall over like a feather from your presence. When a player radiates a sense of total dominance at a game, I call this a “fear aura.” The most unlikely of pale, white computer geeks can strike fear into the hearts of other gamers when they discover that he is, in fact, “PhatDan09” or whatever name is known to dominate tournaments. With the fear aura, he is able to get away with gambits and maneuvers no ordinary player could ever pull off, just because the opponent gives him the extreme benefit of the doubt on everything that occurs in the game. If the wielder of the fear aura appears to be vulnerable, perhaps it is just what he wants you to think. It might be safer to hesitate, and then—oops—to lose. Once you develop your fear aura through excellent play and winning, you will laugh at the relatively ineffective notion of intimidating opponents with offensive verbal comments.